The pass-along chrysanthemum in my garden is mostly gone now. Each year it undergoes a striking color transition as it ages which never fails to interest me. First, tight yellow buds open to these flowers with yellow centers and paler outer petals. Chrysanthemum. Yellow buds give way to pale flowers with bright sunny centers. Nov 2, 2014. As the flower matures the yellow largely disappears from the petals. The petals begin taking on a pink tinge as aging progresses. 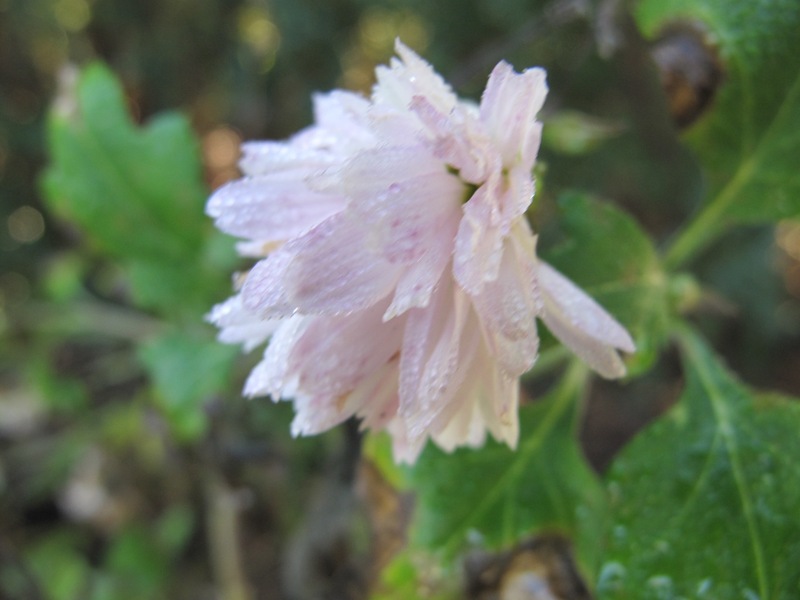 Eventually the fading chrysanthemum transforms itself into a venerable lavender pink. Despite a few frosts, December has been mild. This weekend’s highs will be 74°F/23°C, pleasant enough I should be able to finish up some bulb planting. Anemone coronaria was one of the few successes in my garden last spring and early summer and, unsure how well they would do a second year, I bought a few more to add this fall (part of my weekend planting plans). I am not sure if this is normal but as the summer heat receded the anemones, which had died back, began sending out new foliage and yesterday I even found a bud forming. I hope this anemone has time to open. Some special friends and former neighbors, now living in California, surprised us this week with an unusual fruit gift, local Fuyu persimmons. Have you tried them? Neither my husband nor I had ever tasted a persimmon, so I did a bit of research before eating them. It turns out there are two types, astringent and non-astringent. Fuyu persimmon is the non-astringent, meaning it does not cause your mouth to pucker and turn inside out if eaten before completely ripe. Reading that gave me confidence to taste them and oh, they were delicious, very difficult to describe except that, delicious. And beautiful. 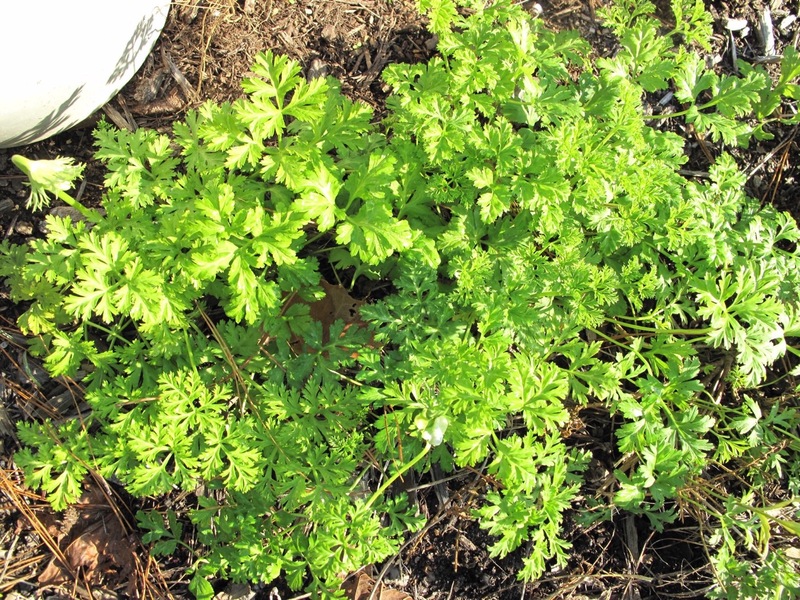 This entry was posted in garden and tagged Anemone coronaria, chrysanthemum, fuyu persimmon on December 11, 2015 by pbmgarden. Those Chrysanthemums look gorgeous, what a treat to have in the garden! Thanks for your comment. Yes, that are a special treat for me, a gift many years ago from a dear relative. I love their quirky color cycle. They are sold over here as luxury and pricey ‘Sharon Fruit’ I’ve tried one when it was in the reduced section but expect they taste a whole lot nicer when fresh. It must have been the same as yours though as definitely not astringent more like a perfumed Palma violet sweet. I love watching the life cycle journey in the garden, some of the special moments in life, it makes the walk through the garden every morning special. I agree Charlie. Plants are just fascinating in all their stages. That chrysanthemum is amazing! Yellow border or pink border…. hmmm. It’s a curiosity isn’t it? Fascinating change in color. I’ve never seen that happen so thanks for sharing. Our weather is way too warm – kind of scary. A fellow gardener told me a friend’s peach trees were budding. Not a good thing. These warm days can wreak havoc with the flowering cycles, can’t they? I saw a flowering apricot the other day also. That said, I’m enjoying having it still be warm and pleasant. 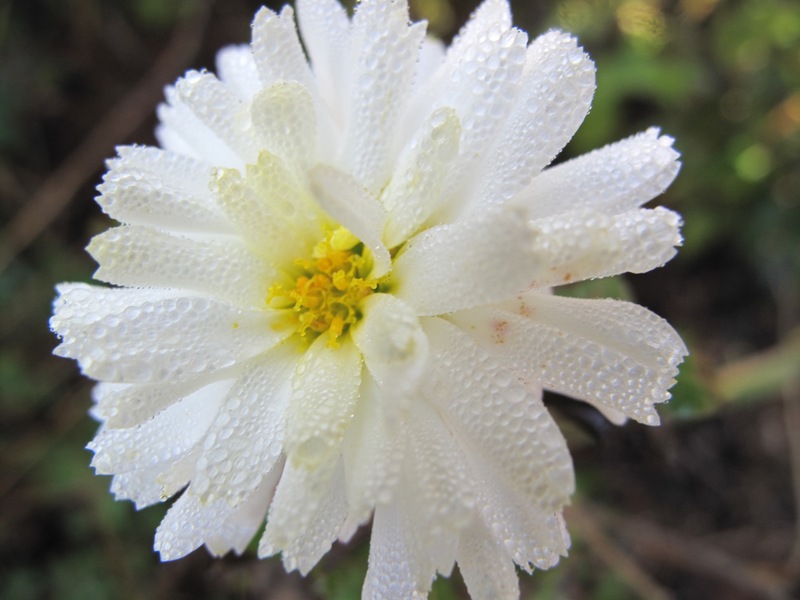 Endlessly entertaining chrysanthemum…who knew? 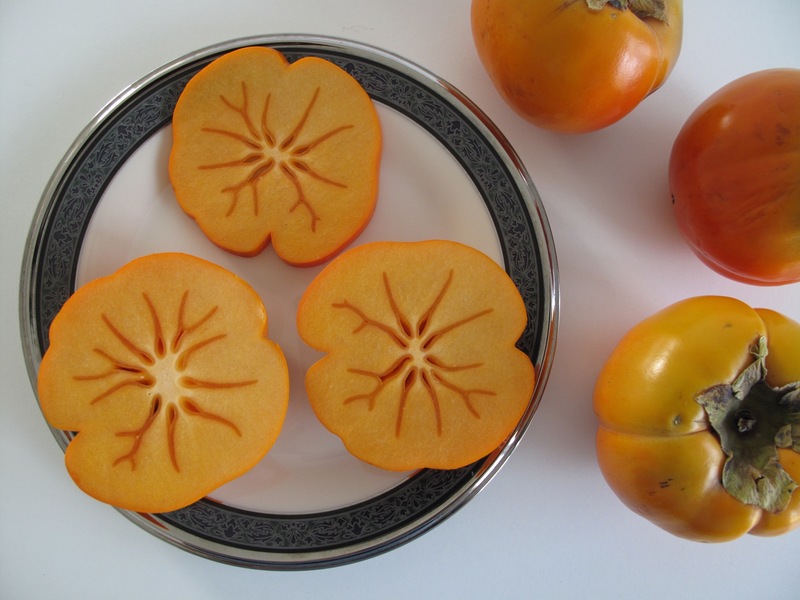 The persimmon is as decorative inside as out…nice to know they are delicious as well. What a pretty salad they would make. 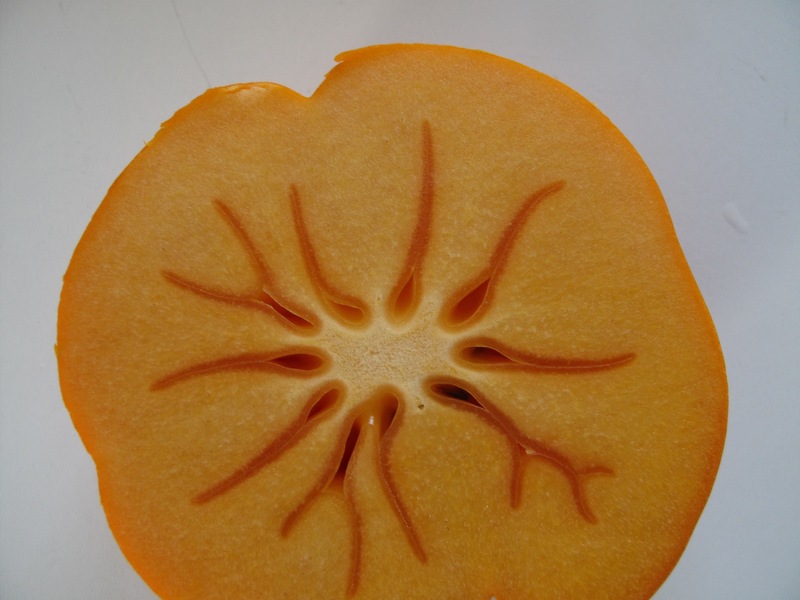 I do love that pattern inside the persimmon. Not sure what to serve with the persimmon. Fuyu are new to me, at first sight I thought they were tomatoes. Hi Brian, the fuyu do indeed look like tomatoes–not the taste though. I look forward to seeing that Anemone blooming in the future. It’s taking its time but I think that anemone will make it. Plants are always more resilient than we expect. A lovely look at the different stages of your Chrysanthemum. Amazing little things! I enjoyed some persimmons when I was living in Japan many years ago – they are quite popular there, and are also thinly sliced and dried or candied for desserts. Delicious! I like the idea of the dried persimmon Cathy. Bet living in Japan was fascinating. I love the pattern on the persimmon! how beautiful. 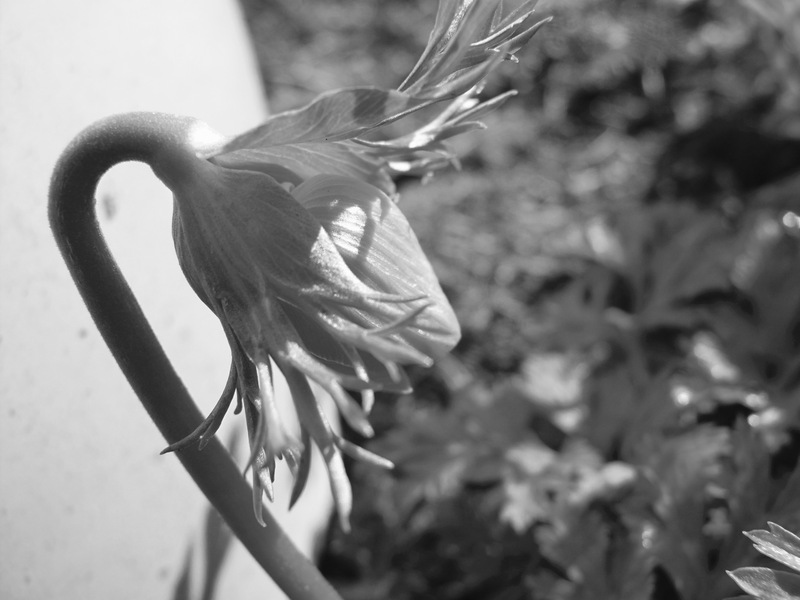 I think autumn foliage is normal for the anemones…. not that I would really know since I’m too far north to grow them, but I’m thrilled you added more. I love the strong colors and contrasts of the flowers. The persimmon pattern is amazing, isn’t it? 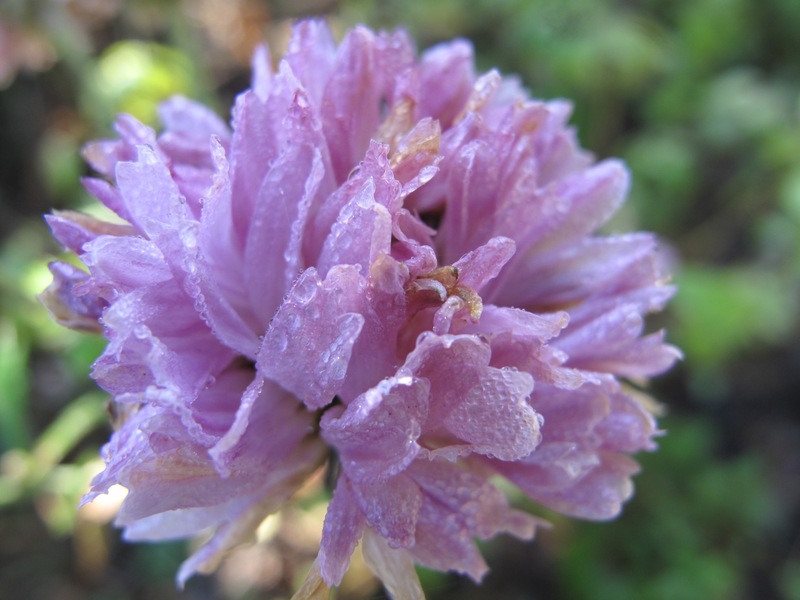 I planted the last of the anemones yesterday so hope to have many to enjoy and share next spring. 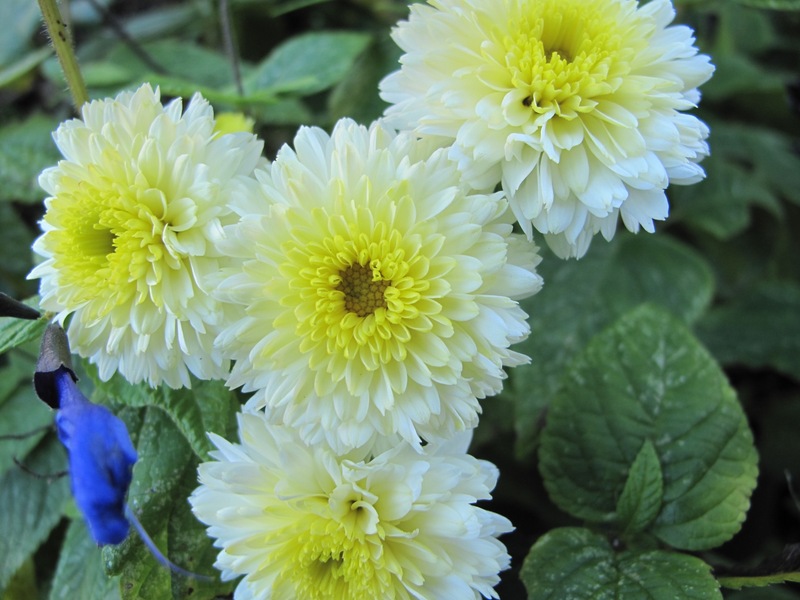 The Chrysanthemum is certainly great value, supplying so many different coloured flowers. My white ones turn pink with cold rather than age but nothing like the lovely lilac colour if yours. I have a persimmon tree, but the birds usually get the fruit before I do, I think they taste a little like a date, I often buy them at this time of year and try very hard not to buy the wrong ones! Perhaps the color differences on my chrysanthemums are also due to temperature. I’ll have to watch for that distinction next year, too late now. Do you have fresh dates? These persimmons are not very sweet, although I can tell some some spots seem riper and sweeter. No, I don’t have fresh dates growing, it isn’t warm enough for them here; I do buy them sometimes as I love them. Until seeing your comment it hadn’t really occurred to me the dates I buy packaged and dried aren’t the way they come off the trees! What a wonderful gift from your friend! 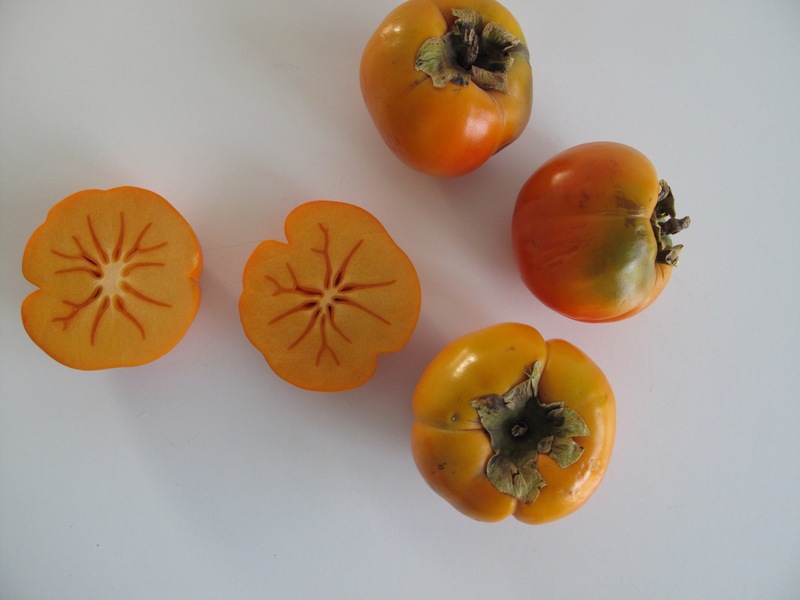 I’ve never tried a Persimmon either–but I’ve heard so much about them. Your Mum is beautiful! I can’t believe you have an Anemone about to bloom! The persimmons have been fun to try. I’m trying to let the last two ripen a little more to see how it affects the flavor. I adore the chrysanthemum–passalongs always bring back nice memories. I’m greedily watching the anemone but it’s not in a big hurry to open. Hi Kevin, yes the flower sets a nice example for aging. Christina mentioned hers is affected in color by cold, so perhaps the temperature is playing a role also. Beautiful chrysanthemums, especially the white one with dew on it. I didn’t realize there are two types of persimmon. I thought it’s just a different shape, either flat or heart shaped. I learn something new everyday. I am fond of that chrysanthemum. It was fun to try the persimmon. The inside of those persimmons is like a work of art! Agreed Donna. One of nature’s many abstract patterns.